Add color to a large tag by stamping with a square sponge several colors of Adirondak pads. Stamp Woman with permanent black ink and add the design squares in various colors as background. Coat tag with a varnish sealer. 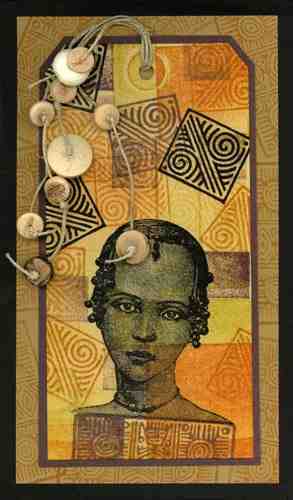 Add fibers and beads and mount on plum paper. Layer again on tan paper that has been stamped with the small design squares and layer again on black.